Retired Aussie Coca Cola executive Dean Wills loves fast cars. In fact, he owns a fleet of exotics that he's always enjoyed driving on uncrowded country byways. There's just one problem. Wills lost his driver's license in 1996 after driving too fast on the coast highway in New South Wales. Not being a track guy, per se, Wills did what any clear-thinking millionaire would do when faced with such a quandary. He built a private country road on his own property. 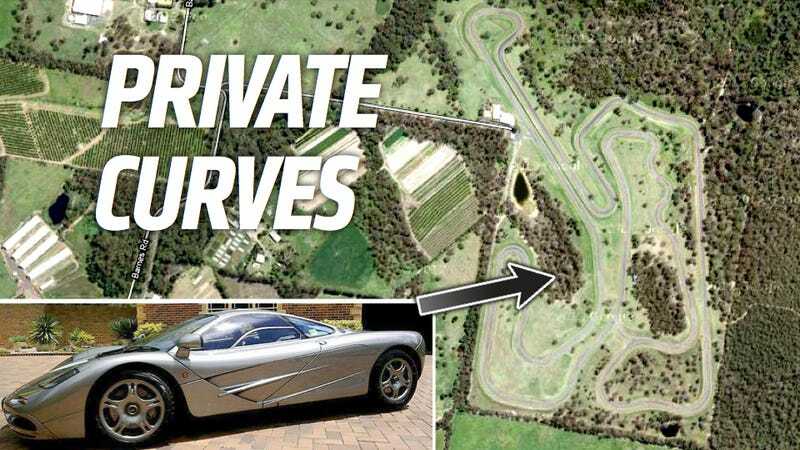 Just over three miles long and located at the south end of rural Kulnura, Australia, the track has 22 turns and reportedly cost about $10 million to build. Wills insists that it isn't actually a track, and prohibits the select few allowed to drive on it from racing one another. But it is for driving fast cars fast, and kind of looks like an F1 track without the red and white stripes and safety barriers. But Wills has disguised the whole thing with bucolic roadside scenery and road speed signs (which most people probably disregard). Lap times aren't recorded, with family and friends — including Formula 1 driver Jack Brabham — driving the course for fun.